Virus Protein 16 (VP16) is a transcription factor encoded by the UL48 gene of Herpes simplex virus-1 (HSV-1). Through complex formation with cellular host factors VP16 can bind to a common regulatory element in the upstream promoter region of immediate-early genes . Due to the transactivating function of VP-16 these genes can then be expressed. VP16 consists of 490 amino acids with two very important functional domains: a core domain in its central region which is necessary for the indirect DNA binding and a carboxy-terminal transactivation domain , ; see Fig.1. The transactivation domain (TAD) of VP16 can be fused to a DNA-binding domain (DBD) of another protein in order to gain expression of a desired target gene . Fig. 1: Domain structure of VP16. The different functional domains of VP16 are shown. Taken from Hirai et al., 2010. The TAD of VP16 is one of the most efficient TADs. It is widely fused to host transcription factors in order to increase their activity or, next to this, to other transcription factors to study the mechanism of gene regulation . In our case the TAD of VP16 was cloned behind a double mutated Cas9 gene (which encodes for a non-cutting dCas9 protein with specific DNA binding properties) to activate our genes of interest. For more information see BBa_K1150019 and BBa_K1150020. VP16 is originally a part of the virus particle from HSV and is released into an animal cell while infection. VP16 first binds via its core domain to the host nuclear protein which then recruits another host nuclear protein, Oct-1, to form a functional protein complex. 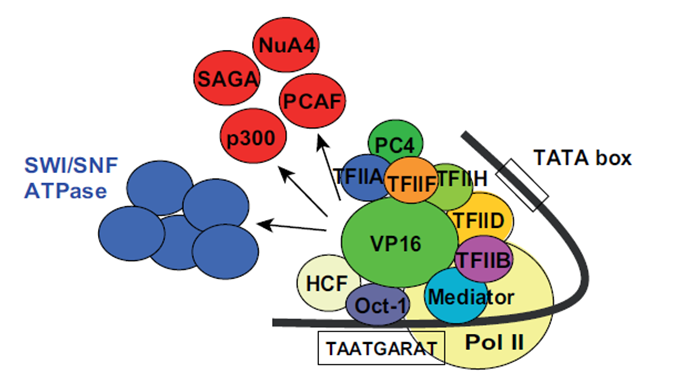 This complex then binds to its target DNA sequence in the promoter region of immediate-early genes where VP16 activates these genes through interactions between its TAD and many different transcription factors and other proteins, such as histone acetyltransferases; see Fig.2. Through these multiple interactions the transactivation domain of VP16 facilitates the assembly of the pre-initiation complex , . Also other TAD containing proteins share this magnitude of binding partners but VP16 is one of the most effective once . WEIR, J. (2001). Regulation of herpes simplex virus gene expression. Gene 271: 117-130. GREAVES, R.; O’HARE, P. (1989). Separation of requirements for protein-DNA complex assembly from those for functional activity in the herpes simplex virus regulatory protein Vmw65. J Virol 63: 1641-1650. TRIEZENBERG, S. J.; KINGSBURY, R. C.; MCKNIGHT, S. L. (1988). Functional dissection of VP16, the trans-activator of herpes simplex virus immediate early gene expression. Genes Dev 2: 718-729. HIRAI, H.; TANI, T; KIKYO, N. (2010). Structure and functions of powerful transactivators: VP16, MyoD and FoxA. Int. J. Dev. Biol. 54: 1589-1596. WALKER, R.; GREAVES, R.; O’HARE, P. (1993). Transcriptional activation by the acidic domain and involves additional determinants distinctof Vmw65 requires the integrity of the domain from those necessary for TFIIB binding. Molecular and Cellular Biology 13: 5233-5244. THOMPSON, R.; PRESTON, C.; SAWTELLl, N. (2009). De Novo Synthesis of VP16 Coordinates the Exit from HSV Latency In Vivo. PLoS Pathog 5: e1000352.